A content tree defines the hierarchial struture of a website. That means what sections are in the website, and what pages are under each section. Think of the content tree as something similar to the outline of a research paper. For example, here's the content tree for the main MPS website. Notice how the items in the tree line up with the navigation users see. 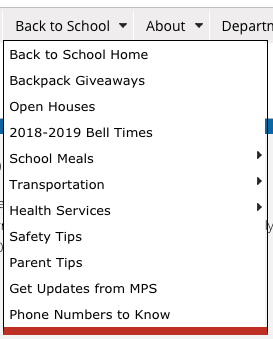 Some sections are hidden or turned off, so they don't show up to website visitors. 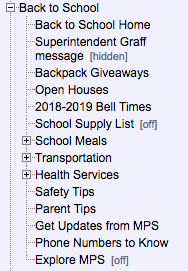 If you expand a section in the content tree, you can see it's subsections and pages. These are indicated on the user view (right) by selecting the arrow in the flyout menu.